There are currently two consultations being run by HS2 Ltd, one on the Phase 2 route which will run through our communities, the other on compensation for the London to Birmingham section. It is essential that as many people as possible respond to both, so please get every member of your household, friends and family members, no matter where they live, to complete responses for each consultation or put in their own submissions – every household in the UK will be paying £3,000 for the pleasure of HS2 so it matters to everyone! Responding couldn’t be easier just sign and date the responses, along with your name and address, and pop them in the post using the freepost address provided, or if local drop them at Smiffies or Swillington Community Centre letterbox (on the gate of Swillington Primary School gate). 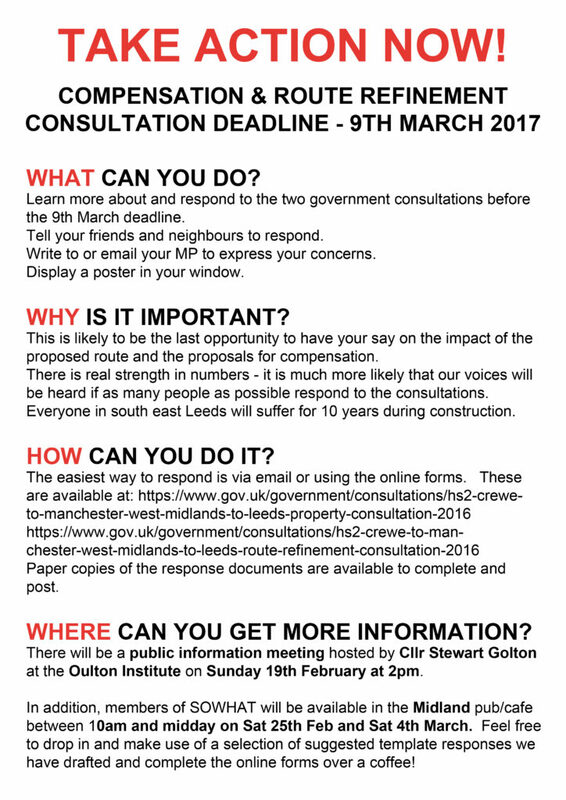 Following the recent HS2 Ltd roadshows in Leeds, Garforth and Rothwell the SOWHAT committee has produced a generic response letter to the Phase 2 route consultation which can be used by anyone wishing to put in a response but for whatever reason don’t want, or feel able to write an individual submission. The letter has been posted out by Alec Shelbrooke MP to over 1,000 homes in the area, SOWHAT will be delivering to further houses, copies have been left in a number of local businesses (Smiffies in Woodlesford, Swillington Community Centre and others), plus it can be downloaded below. HS2 Ltd is currently holding a consultation into compensation on Phase 1, and it follows that what they get so shall we, so we need everyone to respond to this. 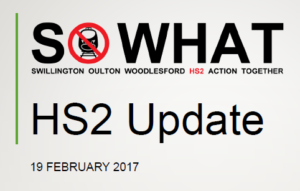 SOWHAT have adapted five versions of a postcard response produced by HS2 Action Alliance, which again can be used to respond to the compensation consultation. A postcard has been sent out to over 1,000 homes in the area by Alec Shelbrooke MP, further will be delivered by SOWHAT, some are available to pick up at various local businesses, or each of the five versions is downloadable below in letter form (you need only print off one version, any will do). This entry was posted in compensation, hs2, latest news, sowhat on November 11, 2013 by admin. Please attend, this is going to be your only chance to meet with HS2 Ltd during this consultation, to ask questions, highlight specific local issues and tell them how it will devastate our lovely villages and countryside. This entry was posted in hs2, latest news, sowhat on October 31, 2013 by admin. HS2 Ltd is currently holding a consultation into compensation on Phase 1, and it follows that what they get so shall we, so we need everyone to respond to this (closing date 4th December). We have had postcard responses printed which will be posted out to over 1,000 homes and also made available at various local businesses to pick up (list to follow). The cards are free to post and only require a signature and address which = 0p and 5 minutes of your time. The consultation questions to which the postcards respond can be found here within response guidance issued by HS2 Action Alliance (this can be used as an alternative to the postcards if you would like to write your own response). This entry was posted in compensation, hs2, latest news, sowhat on October 31, 2013 by admin. It has been a little while since we last provided you with an update on what has been going on, so here goes…. We have established monthly meetings with Alec Shelbrooke MP to discuss developments in our campaign and also Alec’s proposal for an alternative route; so far we have met twice. As part of his work on this, he has arranged for engineers from HS2 Ltd to visit the area so they can be shown the geography of where they are proposing to build whopping great viaducts. Representatives from SOWHAT will be joining the visit. We will keep you informed of the outcome(s). This Sunday, 9th June, Swillington Organic Farm will be holding their annual open day with plenty to do for all the family (lots of baby animals to keep the kids entertained). Ed has had a great idea for illustrating how the train line will carve through the farm and the scale of the viaducts – worth coming along for alone! SOWHAT will be having an information stall at the event, so please come down, between 11am and 4pm, to lend your support to both us and the farm. SOWHAT had a stall at the Rothwell May Day Fair. Lots of people were very interested in hearing about the proposed route and its impact on the local community and environment. It was heartening so many support our efforts and believe the whole project should be scrapped. We will be having another stall at the Rothwell Carnival on Saturday 13th July, so make sure you pay us a visit at Springhead Park. A huge ‘thank you’ to those of you who have donated to the SOWHAT campaign, so far we have raised over £900 which includes a very generous single donation of £500 from Appleyard Arbor Homes Ltd. The funds raised so far have enabled us, amongst other things, to produce leaflets and large format maps of the route, and pay for speakers from national anti HS2 organisations. We have also contributed £200 to HS2AA’s high court appeal fund, more on which below. Unfortunately there has been no such questioning from Leeds City Council as of yet. Back in March HS2 Action Alliance was given leave to appeal the judicial review decision on the environmental case. The ability to lodge the appeal was entirely dependent on £100,000 being raised by the end of May. Through a huge effort, including the raising of £20,000 over the last May bank holiday, the target was achieved and it is now all systems go for an appeal hearing in the near future. We’ll keep you updated on the outcome. As you will all be aware the Exceptional Hardship Scheme consultation closed on 20th May. Hopefully it won’t be too long before HS2 Ltd publish the findings/results. A big thank you to everyone who submitted a response. We will post our group response on the website very soon. Stop HS2 are holding a national convention on 29th June at Stafford County Showground, bringing together groups from across phase 1 and 2. A couple of representatives will be attending and we’ll provide an update after the event. This entry was posted in hs2, latest news, sowhat and tagged alec shelbrooke, hs2, oulton, saynohs2, sowhat, swillington, woodlesford on June 6, 2013 by admin. Those who have already submitted a response can provide a new/further response if they wish in light of the new information released. This entry was posted in hs2, latest news, sowhat on April 29, 2013 by admin. It is essential that as many people as possible respond to the Government/HS2’s consultation on the proposals for the HS2 “Exceptional Hardship Scheme”. To provide assistance in completing your consultation response the SOWHAT committee has put together a guidance document highlighting key points/issues with the proposed EHS scheme which you may wish to include in your submission. In addition to this we have received a similar document from the HS2 Action Alliance which has been shaped by experience from phase 1. Please take the time to respond and urge as many of your friends and family to also do so, no matter where they live – it’s a numbers game! !